Before last month I had never rented a limo before, but after renting a limo from SerpentineLimos in Los Angeles, I plan on doing it again soon. The driver of our limo was extremely friendly, there were plenty of amenities already stocked in the limo including plenty of alcohol and snacks, we were on time to my friend's wedding, and the driver was early getting back to pick us up. I was extremely impressed with his work ethic and his friendliness. I was recommended this service by a work colleague who said he had rented a party van for a bachelor party for his brother. We rented a stretch H2 Hummer Limousine. The H2 came with multiple flat panel tvs, a small bar, LED lights everywhere that would change, an awesome music system, comfortable seats which sat probably 12 plus people, and a comfortable air conditioning system. If your party is around 10 to 12 people I would suggest renting the H2 but if you have more people consider one of the other stretch SUVs. SerpentineLimos primary business is in the LA area but from what I remember the driver telling me, they do business in Orange County and San Diego County as well. 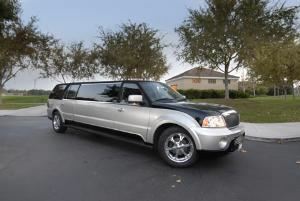 If you are looking more of a classy atmosphere rather than a party bus type atmosphere, they also have stretch Chryslers and Lincoln Town Car limos, both of which come stock with bars and at least one or two flat panel tvs. These are probably more desirable for funerals or proms or more formal occasions.